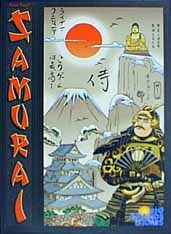 Samurai , Reiner Knizia, Hans im Glück, Rio Grande Games, 1998. Samurai is an abstract board game by Reiner Knizia released simultaneously in Germany and the United States by Hans im Glück and Rio Grande Games. The game is set in feudal times upon the 4 main islands of Japan. Superimposed upon the board is a hexagonal grid that follows the irregular outline of the islands and the adjoining seas. Like many recent German games, the theme's purpose is predominantly of asthetic value and only slightly affects game play. Players vie to capture three groups of tokens representing the warriors, priests and farmers of Japan, 13 tokens in each group. The tokens are reminiscent of Japanese netsukes and are rendered in a gorgeous black glass-like material that I have not seen in any game before. These immobile tokens begin the game in the cities and villages of the map and are captured by placing hexagonal tiles adjacent to the tokens. Once the last hex tile surrounds the object, the value of the tiles are calculated and the tokens are awarded to the strongest player or discarded if the score is tied. The hex tiles, the same set for each player, come in several flavors and impart the variety to the game play. The first type of tiles depict a specific warrior, priest, or farmer, affecting their respective faction with a score value from 2 to 4. The next group of tiles depict a Samurai warrior and come in strengths of 1 to 3. The Samurai is a wild-card tile which affects all classes of tokens. Next comes the Ronin and boat tiles which also affect all tokens, but have a unique Japanese character marking which allows one to play any number of them per player turn. This character marking turns these tiles into a powerful, rapid deployment force enabling them to quickly influence a region. Finally, two special tiles allow one to replace a scoring tile or swap two tokens. These are the only tiles that allow tile or token movement. Otherwise the game is very similar to a multi-dimensional Go: tiles are placed and influence develops, eventually areas are conquered. Unlike Go, the influence affects the three token groups and not just the local area. One area of the game I have not quite understood is the unique end-game scoring rules. This has lead to a number of embarassing last place finishes when teaching this game to a set of first-time players. In other games one would maximize the score in each of the three groups of warriors, priests, and farmers. In Samurai , victory requires that you have a majority in one of the three groups, but the final score is calculated from your two minority groups. Thus if you score 7 warriors (majority), 3 priests, and 2 farmers, your final game score would be 5. Tying your majority group score with another player yields the heavy penalty of "NO MAJORITY", preventing you from vying for victory. So the score of 7W (tie), 3P, and 2F would not allow you a victory. This is a rather heavy penalty for the coincidence of a tie, similar to two front running presidential candidates forfeiting an election to a distant third place candidate simply because of a scoring tie. In the 3 and 4 player games, the captured tokens are hidden behind the player screen so one cannot simply count tokens. This is one area of the game in which players who count scores have a big advantage over non-counters, a game characterstic I very much dislike. To even the disadvantage I recommend that everyone play with captured pieces in the open. Samurai also features ideas that I like and would enjoy in more game designs. First, the game has a variable length and is not a set number of turns. It ends when the last token of one of the groups is taken or four of the tokens have been discarded from a tie score. Variable endings are great because it is another element of strategy that players choose: leaders try to end the game early, followers try to prolong the game. The game also has a variable size map based on the number of players: two players use only the island of Honshu (2 cities, Edo and Akita, and 6 villages), three players add Kyushu and Shikoku (adding 9 villages), four players add Hokkaido (adding 1 city, Sapporo, and 6 villages). Great ideas. I would enjoy seeing expansion sets for this game, allowing 5 to 8 players and expanding the map to include other territories or islands. It will be difficult because of the scoring system, but it would be fun. Does the designer add a new category of tokens, allowing more players to vie for victory? Or does one simply add more of the same tokens, forcing the players to battle for the extremely scarce resources? It's a fun thought experiment, but I wouldn't hold my breath for an expansion. Knizia is very prolific, but I don't think he has ever designed an expansion for one of his games. Others have compared this Reiner Knizia game to his other recent games Euphrat & Tigris and Durch die Wüste . Like the others, this game has a very balanced feel and is sharpened to a fine edge. Tinkerers who like to change or stretch rules will find that changing the number or quality of tiles may unbalance the game and must be done with the utmost care. Of the three, I think Euphrat & Tigris has the most fluid and changing map and Samurai has the most static feel of the three. It seems in Samurai that once the tokens are taken from an area, that area can be safely ignored. Yes there are the swap and replace tiles, but these usually only affect the play slightly by causing a win or loss of one token. The three games are all very spatially oriented much like the game of Go. Those with a good sense of size, shape, color recognition, and proximity will do well in these games. The three games have similar scoring mechanisms, score victory points in several categories, but Samurai has that funky majority rule which radically changes the nature of the game especially in a four player game. More players in Euphrat & Tigris and Durch die Wüste simply reduces breathing room, but leaves the game unchanged. More players in Samurai will cut short one player's hope for victory. In terms of fun and strategy making, I would place Samurai in the middle of the other two, not as complex and sublime as E&T, not so much slam-bang fun as DDW. Finally, let me add a few more random likes and dislikes. The game has excellent component quality, in line with other Hans im Glück games: a thick embossed board, beautiful unifying artwork, and a nice heft to the tiles. The Rio Grande Games english rules translation is excellent, not just a black and white typewritten translation, but a full color, bonifide rules booklet including illustrations: highest kudos to Rio Grande Games. On the negative side, I am a bit disappointed that there are no extra blank tiles for gamers to experiment with or to replace the tile that the dog munched. All in all, I give Samurai a very high rating. I have played it many times, and I look forward to playing it more. There is little chance, and there is a sublime feel of wanting to challenge the other players in many areas, but only having the resources to do it in a few. The game is quick to explain (50% of the explanation time goes to the special scoring rules), and within one turn all players are thinking about strategies. I'm sure on any gaming evening this game will be suggested frequently. [an error occurred while processing this directive] Last modified: Thursday, 09-Jun-2011 12:37:01 MST.